I’ll be honest, I don’t really crave cold salads throughout the long winter months. All summer long, give me a crispy, crunchy, colorful raw salad, but once the cold weather rolls in? Nope. That doesn’t mean that I don’t love winter greens though. I do! I love their dark, rich flavors and colors. I love how hearty they are, how long they last, and how they can hold up to the heavier dishes we tend to make in the winter. So I decided to experiment with a winter salad that doesn’t incorporate the typical summertime flavors (i.e. light lettuce, tomatoes, cucumbers). This salad solved my dilemma. It’s very easy to make, and can work as either a side dish or your main if you add a protein of choice and whole grain source to it. I think it would be so delicious with some roasted butternut squash or sweet potato and toasted hazelnuts; I might try that variation next. 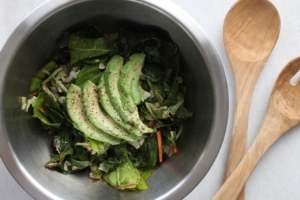 The key to make this dish work well is to massage your greens with the dressing (i.e. use your hands and lightly knead the leaves with your fingers to break their rigidity). This will help the greens become more tender and less bitter prior to eating. Go to the Farmer’s Market this week, pick up some beautiful dark greens and try this one out! Dark greens get a bit brighter with some simple additions . Put your greens in a large bowl. Pour the olive oil and vinegar (or your salad dressing of choice), as well as the salt, pepper and sumac (if using) on the greens. Massage the greens with the dressing until they start to break down a bit; they will become less structured and probably decrease in size. Add in the cabbage slaw. Mix well and top with avocado or other toppings as desired.